These are nothing like your grandfather’s car companies. Let’s take a look at how these Silicon Valley tech companies will change the way we get from A to B forever. Computers will soon be driving our cars for us. The number of computers in our cars is increasing each year with navigation, web browsing, Bluetooth cell phone access, and more. As cars begin to do more of the driving for us, we will have even more electronics on board to keep us entertained. In order to have the most reliable computer components last the life of a car, the best manufacturing processes available must be employed. Plasma etching the printed circuit boards is the most reliable way to build computer components for future vehicles. Plasma has the ability to dry etch circuit boards in a directional manner, meaning the plasma can etch a circuit board straight down with no side to side removal. Dry etching is the most reliable way to etch a circuit board, and reliable circuit boards mean reliable cars. Plasma surface activation also increases the bond strength of components such as air bag sensors and accelerometers that aid in computer driving. That’s right, windshields. How would we get anywhere without them? Windshields are made up of multiple layers of tempered glass. This allows them to be shatter proof, so we don’t end up covered in glass if we hit a falling pine cone at 60 mph! But how do you put multiple layers of glass together without any dust in between? You guessed it, plasma. Traditional methods of cleaning involved harsh chemicals, dangerous working conditions, and lots of waste. Traditional methods can also leave a film behind so you don’t have a perfect window. Plasma can not only clean each layer of a windshield without any harsh chemicals, but it can also activate the surface to form a stronger, better bond between the materials! Plasma allows us to create better windshields with less impact on our environment! Headlights in today’s cars are treated with plasma to keep them working after years of service. A plasma polymer is applied to the reflective surfaces using a plasma coating technique. This keeps the aluminum in the reflective surface from corroding and from reducing the effectiveness of the headlight. Dim headlights are dangerous! Thanks to plasma, we can all see a little better at night. Painting or bonding to plastic is much more difficult than metal. Painting plastic parts requires a perfectly clean surface in order for the paint to bond properly and evenly to the plastic. Plasma cleaning is able to fully clean the plastic and allow the painted plastic to match the painted metal surfaces. Plasma also activates the surface to keep the paint from peeling off later! Plasma treated plastics will become scratch resistant enough in the future that we will most likely see plastic windows in our cars. The plasma will coat plastic with a scratch resisting polymer, preventing the plastic window from scratching or hazing with age. Plastic is lighter than glass and will therefore save energy. Most folks don’t realize the role that plasma plays in our everyday lives. As our cars are electrified and computerized, plasma will play a large role in the automotive space. There are exciting things happening in the car industry. Keep your eyes open for new ways that plasma is making our world safer and cleaner! Learn about how the temperature inside the chamber can affect the etching speed in this follow up post to our August 24th post, Temperature Control During Plasma Treatment. 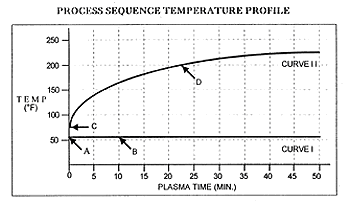 Process temperature is the single most important parameter in the plasma process. Process temperature has primary control over etch rate and has a secondary effect on etch uniformity. The temperature at which the process operates has a major influence on processing rates. The higher the process temperature, the faster the processing rate. Process temperature control is mandatory when processing temperature sensitive devices. Uncontrolled process temperatures can cause distortion, delaminating, and discoloration, and can chemically modify the properties of temperature sensitive devices. • The boards are loaded directly onto the temperature controlled electrode surfaces. • Process temperature is independent of the plasma process and programmable in the range of O°F to 300°F ± 0.5°F. • An elevated process temperature is selected which is compatible with the type of board material (epoxy, polyimide, acrylic/kapton, Teflon, etc.) being processed, while maintaining maximum processing throughput. • The temperature control system is a patented feature, unique to the Plasma Etch product line. 2. 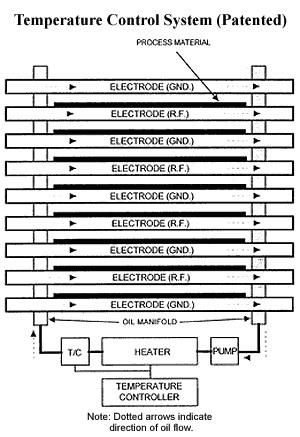 Etch rates are predictable and repeatable, due to steady state process temperature. 3. Etch rates are accelerated by using elevated process temperatures. 4. No throughput limiting temperature stabilization sequencing (“dummy plasma cycling”) is required. 5. Start and stop system operation requires no throughput limiting temperature stabilization cycle. 6. Temperature control is independent of the plasma process. 7. 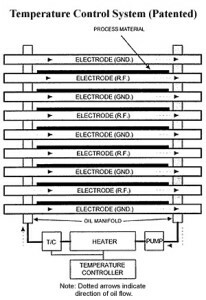 Temperature control techniques use proven and highly reliable design (recirculation heat transfer fluid). 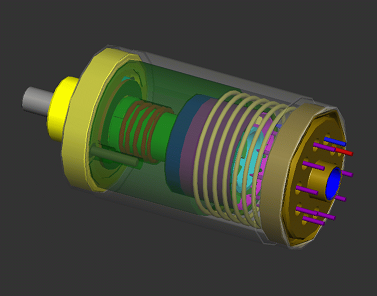 No temperature control elements are exposed to the plasma process. 8. Any process temperature from 175°F to 300°F may be selected for compatibility with all board materials. Optionally, the temperature range may be extended from O°F to 300°F. 1. Points A and B are the respective starting and the ending points of the plasma process sequence. 2. Processing temperature is essentially constant throughout the plasma sequence. Any temperature within the control range may be selected and is automatically maintained. 3. Constant process temperature ensures plasma process repeatability. 1. Points C and D are the respective starting and the ending points of the plasma process sequence. 2. The starting temperature at point C is undefined, as it depends on residual system heat from the previous process cycle. 3. The slope of tile temperature profile from point C to point D is dependent on the thermal loading effect of the materials (mass of the load) being processed and the plasma processing parameters (primarily R.F. power level). 4. The ending temperature at point D is a variable, as it is dependent on items 2 and 3 above. 5. The repeatability of the plasma process is severely impaired by this lack of a constant processing temperature.